Even though this is from a couple of years ago, you will still want to acquire one of this limited edition medal, commemorating the Christmas Lighting of SP794 during her 100th year! 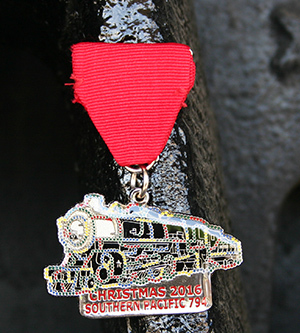 The multi-colored dots on the medal represent the thousands of lights that place on the locomotive every year. If you have never seen her lit up with the lights, be sure to check out SP794 Holiday Lights page on our site to see past years' lights. We only have a few of these left, so get yours today!